Use the PPro8 Imbalance Locator to see imbalance shares during a market’s opening and closing auctions. 1. On the PPro8 toolbar, click ImbalanceLocator. 2. The Imbalance Locator appears. 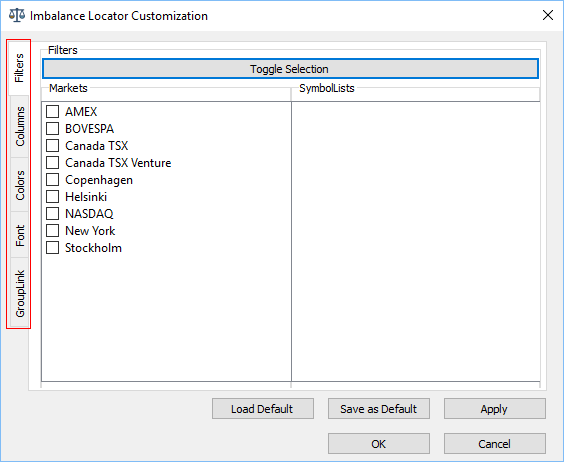 To make changes to the Imbalance Locator settings, right-click in the Imbalance Locator to open the Imbalance Locator Customization. This window displays four main tabs on the left: Filters, Columns, Colors, and Font. Use the Filters window to filter imbalance shares by market or symbol list. 1. In the Filters window, select or clear the check box for each market or symbol list you want to display or hide imbalance data for. 2. Click Toggle Selection to switch between selections, i.e., select previously cleared check boxes and clear previously selected check boxes. 4. The filtered imbalance data appear. Use the Columns window to manage columns that appear in the Imbalance Locator. Click the Columns tab to open the Columns window. 1. In the Columns window, click an item in the Unselected Items list. 4. 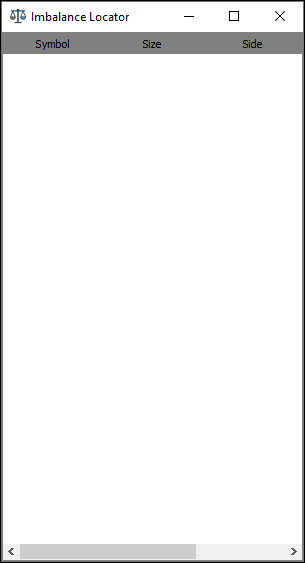 The column appears in the Imbalance Locator window. 1. In the Columns window, click an item in the Selected Items list. 4. The column is hidden from the Imbalance Locator window. Use the Colors window to set the colors for the header, grid line, and rows. Click the Colors tab to open the Colors window. 1. In the Colors window, double-click a color box. 2. The Color Selector window appears. Click a color, and then click OK.
3. In the Colors window, click OK.
Use the Font window to set the overall font for the Imbalance Locator. Click the Font tab to open the Font window. 1. In the Font window, click Set Font. 5. In the Customization window, click OK.
6. The font is set. Use the GroupLink view to group the Imbalance Locator with other PPro8 tools. Click the GroupLink tab to open the GroupLink view. 1. In the GroupLink view, select the check box for the Link Window to Group Number option, and then click or type the window group number. 3. The group link is set.